#1 : Your watercraft: It all depends on what you have been training on and ready to perform your best at. This could be from prone, to stand up to OC1, OC2 and more. Try to train on that particular craft for at least a month before the day of the race. You want to build that relationship and know every movement you have together so there are no surprises. 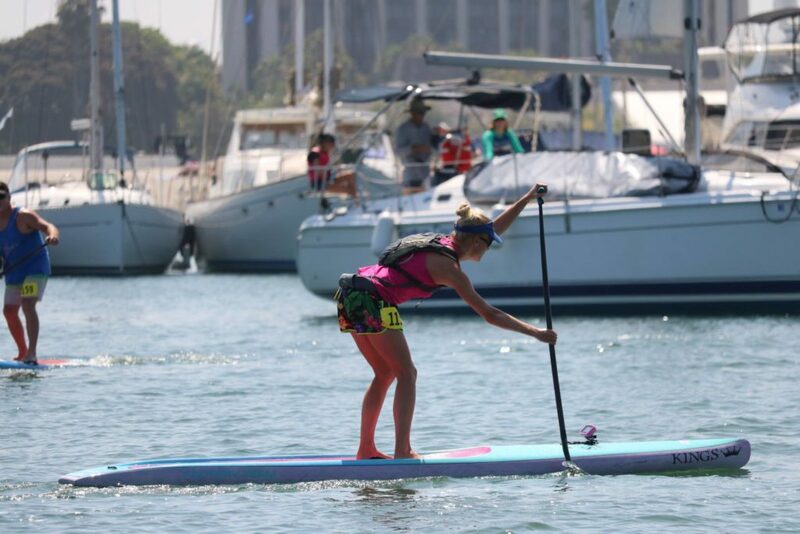 West Coast Paddle Sports Ambassador Shonna Brown at the Sunday Sunday Sunday Race series in San Diego. 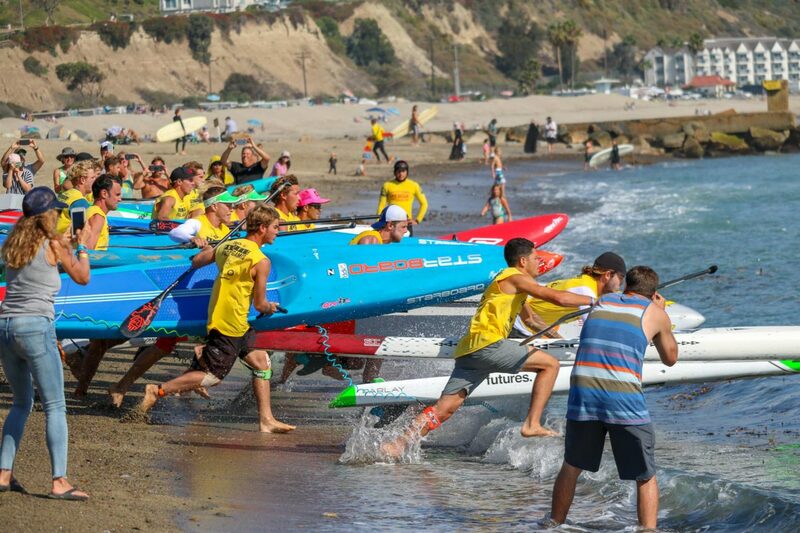 #2 : Paddle: You want to make sure that you have broken in a paddle that has been correctly sized for you to race. As the years have gone by there have been many versions on how to correctly size your paddle. Simply place the “Shaka” sign above your head placing your thumb pointed down on the top of your head in the middle extending the pinky finger in a straight line towards the sky. You want the t-handle to meet the top of the pinky finger. Some paddlers prefer to add wax to the paddle shaft creating a greater grasp on the paddle. Others like to wear paddle gloves for longer distances to prevent blisters and protection from the sun. #4 : PFD: Even the most experienced paddlers wear life jackets whenever they’re on the water. Recommended for anyone 16 years of age and older; and over 80 lbs is a Belt Pack Manual Inflatable Life Jacket. 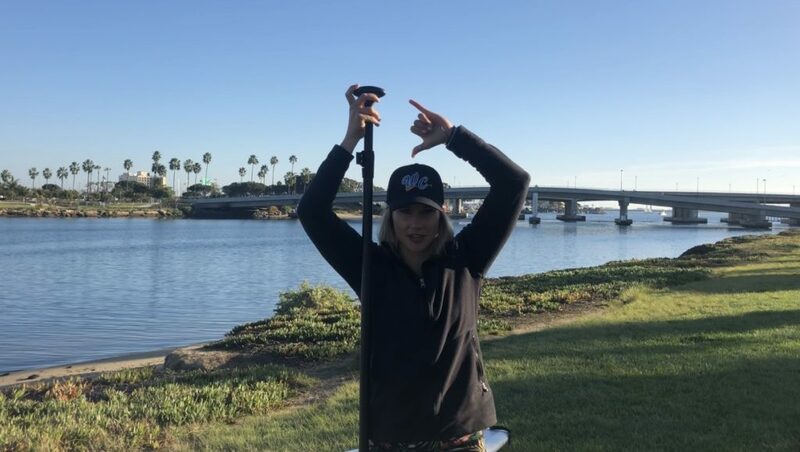 They are uniquely designed that keeps stand up paddle boarders, anglers, boaters and other paddlers safe without compromising movement. The fin is one of the most important elements of a stand up paddle board, affecting your speed and route. 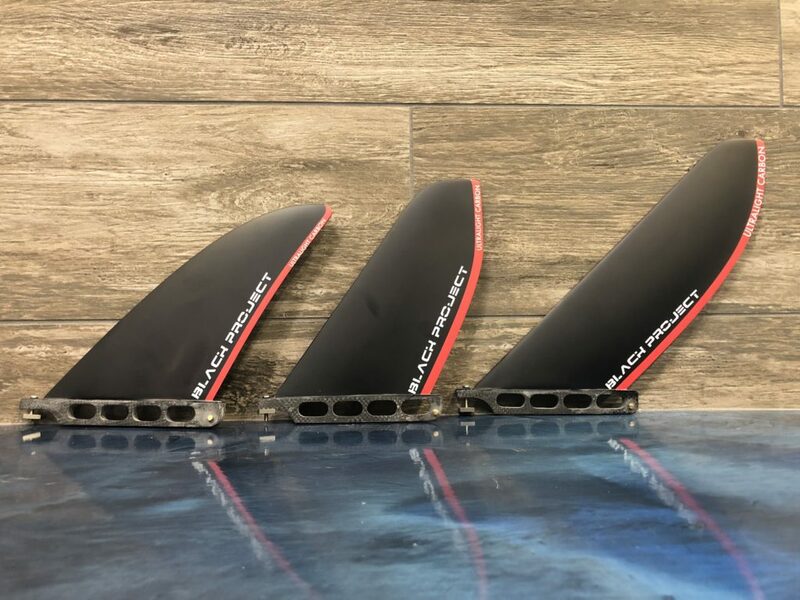 There are so many different types of fins with altered shape, different materials, weight and size. Depending on the particular conditions you are padding in you want to have the proper fin that will allow for better buoy turns, track straighter in flat water or easily slide through bumps while in the open ocean. Here are Fin examples from Black Project SUP for each type of race. LEFT: SONIC v4.1 is designed to help you maneuver to connect bumps while down-winding, sprint faster on flat water and surf into the finish with speed and style. MIDDLE: TIGER ver 2.0 is the go to fun for advanced & elite level athletes to maintain higher average speeds, promote faster buoy tune and deliver blistering finishing sprints. RIGHT: MALIKO ver 2.0 helps you track straighter on rough water affected by wind and current and reduce paddle swaps enabling you to power through the chop more effectively! #6: Hydration: Hydration is so important during a race, especially since you are paddling for hours. It is recommended to wear a hydration pack that attaches to your back or around the waist. It is important that it is big enough to hold enough water, but small enough that it does not limit your mobility during the race. 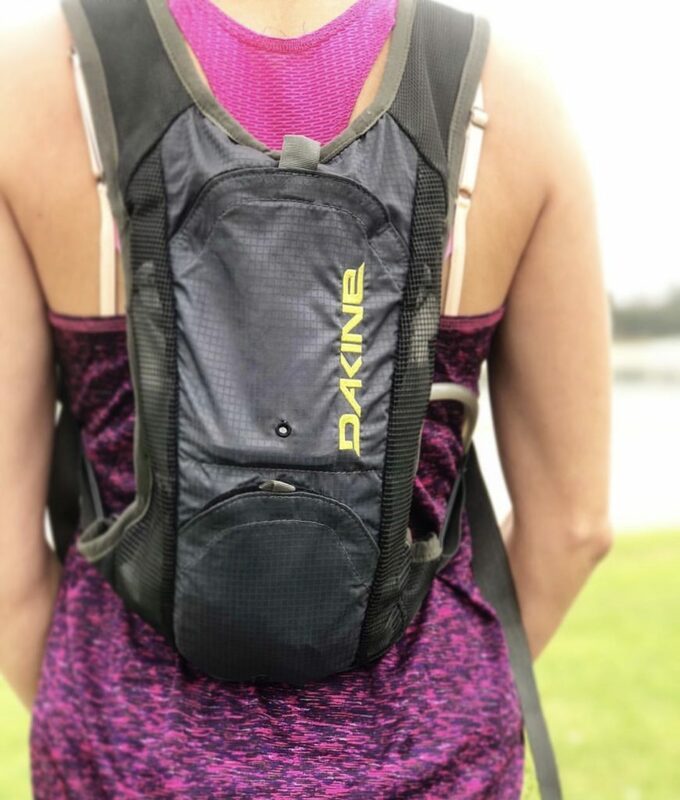 All the West Coast Paddlers highly recommend the Dakine Waterman Hydration Pack that holds 2L and has a built in whistle to the straps. #7: Sun Protection / Booties: Even if it is a cloudy winter day during a race, you still need to protect yourself from several factors. Always wear sunscreen, the sun reflects off the water and directly at you. Headhunters offers a variety amount of different sunscreen applications and is one of the most trusted original brands trusted by surfers. It is also smart to wear a hat to block direct sunlight to your face and neck. – Having Polarized Sunglasses will help with sun protection as well as clarity of the water. We highly recommend Bombers Floating eye wear so you do not have to worry about losing them in the deep blue sea. Sport extra protection of not losing your sunglasses with croakies. #8 : Registration: Lastly! One of the most important things to do so you are 100% race ready is that you are actually registered for the race! Pre-registration is important so the organizers of the race can know the total race participation for supplies, volunteers and schedule of events.